Provincetown is the perfect destination for those who consider their four-legged friends to be part of the family. Provincetown welcomes your dog to come along for whale-watching, sunset cruises, running on the miles of off-leash beaches and enjoy our safe enclosed town dog park. Owners will be charged an additional $25.00 per night per pet. For everyone's comfort, there is a limit of two (2) dogs you may bring. Dogs must be well behaved and get along with humans and other canines. Any damage done to rooms or other people on the premises by companion animals is the absolute responsibility of the pet's owner. Pets that cause any disturbance (e.g. : barking, scratching), may not be left unattended and/or must stay with owners at all times. Pets, that goes for your owners too! If companion animals are left unattended during daily servicing hours and appear to be protective of the room, it is understood that that room will not be serviced. We ask if your companion animal is accustomed to lying on furniture such as beds, couches, etc., that you bring blankets or sheets to cover those areas. If you need a blanket provided, just let us know. We reserve the right to terminate occupancy without refund if damage or disturbances or barking persists. Gabriel’s maintains a lovely garden area. Out of respect for other guests and our property, please don't forget to pick up the poop! We provide bags on the side of the 102 building to the right of the office door. Dog Gone Sailing Charters with Captain Rosemary 508.566.0410. 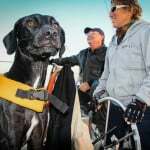 Private sailing excursions for 2-6 folks and your dogs. Dogs must be under voice and sight control. Please ALWAYS CLEAN-UP after your animal and dispose of the waste in a waste container so that residents and visitors can continue to enjoy off-leash time. Bags are provided at many locations throughout the town including right by our office door. Provincetown Pet Resort . Daycare for pets, grooming, and boarding services.